To be a heretic in earlier centuries – that is, to denounce a proclamation from the church at-large – was worse than aligning yourself to another religion entirely. Better to be a Muslim or Jew than to be a self-professed Christian who believed something other than what The Church was teaching. Man, talk about living in the tension! Heresy was less about rebellion and more about devout believers searching for truth. Sure, there were folks who sought to poke the papacy for the fun of it, but according to Jonathan Wright’s research, most believers were after the heart of God, looking to find Him (or Her?) in places where The Church said He didn’t exist. 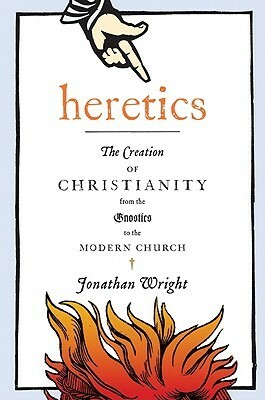 Because Wright is an agnostic, Heretics comes across as an objective dissection of how The Church broke apart (again and again) and subsequently spread throughout its 2,000 years of history. It goes deeper that the obvious hell-raisers, like Martin Luther and John Calvin, to look at rare ancient and medieval believers who were heavily influenced by their political and social order. Wright asks his readers to keep their judgment at bay and try to understand the scope and spectrum in which these heretics lived. It’s easy to sit on the other side of the Reformation and think, “Gosh, they were all nuts!” Instead, considering the certain death (by boiling, hanging, disembowelment, etc.) that heretics experienced, these people were brave in their convictions, and it’s quite possible that without their efforts, you wouldn’t have the freedom to worship in your own church of choice today. It’s a curious thing to consider heretics as potential heroes of the Christian faith, particularly when many of the topics over which heretics argued do not align with my own belief system. But, had they not existed, had they not challenged The Church, had they not died to preserve their own spiritual liberty, then maybe I wouldn’t have the freedom to work out my faith today. Perhaps religious heresy is less about the authenticity of transubstantiation and more about the freedom to solidify one’s own belief about the sacrament of communion. For those who interested in Church history, I highly recommend this book. Buy Heretics: The Creation of Christianity from the Gnostics to the Modern Church here.